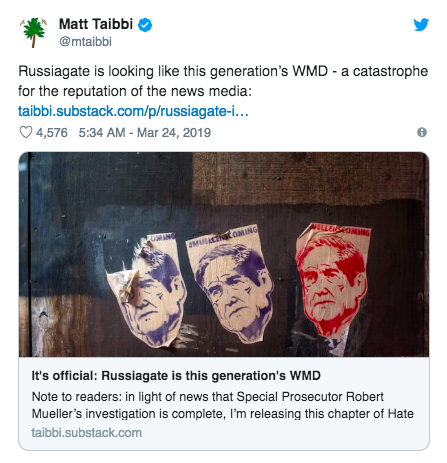 "For almost three years I’ve been lambasted every single day for 'defending Trump' because I rejected that there was ample evidence for a Trump/Russia global espionage conspiracy," tweeted journalist Michael Tracey. "You know who was really 'defending Trump' after all? The people who promoted this nonsense." I am really happy to see everyone congratulating each other on social media. For those of you who think this is a little unseemly, let that go right now. Pat yourself on the back and make sure you give others props too. Make thank you lists of people who held strong and send them out on social media. Write "I told you so" posts. It's important that we mark a line in the sand right now or else the gaslighting will continue and history will be written over. Say it loud and proud that you were right, and they were wrong. The manipulators' efforts will now go into getting people to delay their reactions for as long as possible ("Wait until we've seen the report!") 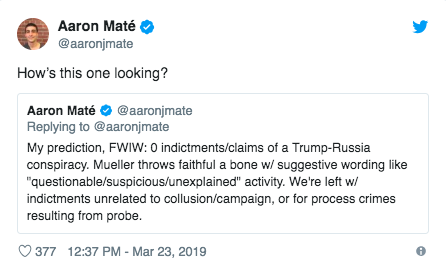 while they move the goalposts ("It was always about insert anything but Russian collusion here for me") and/or memory hole the whole deal by saying as little as possible and moving the news cycle as quickly as they can on to the next thing. If we all stand around being polite, they will get away with it. Don't let them. Make this one stick. It feels so good to be right. 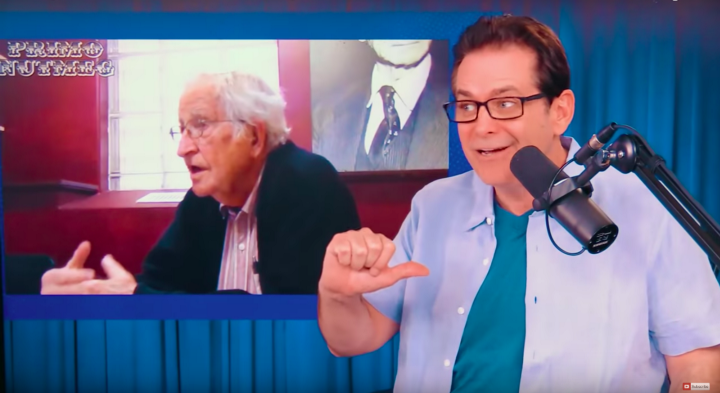 I have Jimmy Dore to thank for getting me off the Russiagate nonsense. Congratulations Caitlin Johnstone - you were so right! the FBI has way too much power over the presidency, way more than "Putin" and his facebook memes; remember that meeting between Hillary Clinton's husband & the head of the FBI shortly before the election? It was pretty annoying to see how many "professionals" in the media industry get the Russia hacking story wrong. It just shows journalists are lazy right now and are not actually going to source any documents or read at all. They just follow or do what they are told. Thankful it's over now. Next, Maybe the left can finally realize identity politics is the other cancer in the party causing mass exodus to the right. This one issue creates a large amount of rotting from the inside out. Don't forget about the hot battles in your cold war.